BELTS Store Co has been operating in Saudi Arabia and the neighbouring Gulf countries since 1959, providing products and services with high level of business standards. Headquartered in Dammam in Saudi Arabia, the company has established mutually beneficial relationship with a vast range of clients and service providers. Essentially a trading company, Belts Store hopes to achieve maximum growth in the industrial sector by making sure it provides high quality products and associated services in collaboration with a number of specialised national and international firms. The company is currently importing all products in collaboration with multinational companies from Germany, Japan, Spain, Taiwan, and many other countries in which it is represented solely or partially. Within the industrial sector, Belts Store is known as the most reliable supplier of all kinds of industrial transmission belts, bearings, conveyor system parts and accessories, rubber products, industrial insulation, chains and sprockets and pulleys. “Our strength is reinforced by the availability of vast variation of stocks of materials used for this industry. We are operating in the wholesale, retail sales and corporate sales business. We aim to serve the industrial sector by joining hands with more organisations in the years to come, utilising our skill and expertise,” says Mohammed Saeed Basaffar, executive manager, Belts Store. 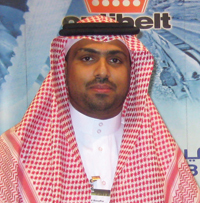 Belts Store has partnered with major companies like Optibelt of Germany, Mithsubishi of Japan, Kauman of Spain, Diado of Japan, Maroc Rolleaux of Morocco and Cranflex of the UK and is serving major firms such Maaden, Saudi Aramco, Sabic and other major industrial companies within Saudi Arabia and other Gulf countries. “We aim to be the undisputed leader in this field,” adds Basaffar. To support its customers’ business needs, the company has recently entered into a new partnership with the famous Japanese bearing company, Nachi-Fujikoshi Bearings. “Nachi Bearings makes a full range of bearings for a wide variety of needs and have incessantly pushed the limits of possibility, creating innovative flush-ground angular contact bearings, the highest-capacity spherical bearings in the industry, and numerous high-precision solutions for virtually any bearing application,” says Basaffar about Nachi.